Every woman deserves a special gown on her wedding day, and whether it’s a lace wedding dress, A-line style, or vintage wedding dress, we know it can be hard. We understand how overwhelming the process can be to find an affordable, flattering, timeless dress. 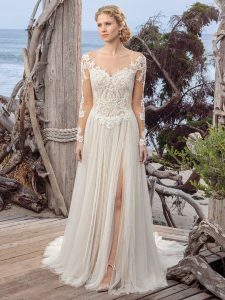 Perhaps you have already tried on countless dresses, and you wish you could pair the top half of the sleeved mermaid wedding dress with the bottom of that youthful, pocketed A-line you loved. What if you had customizable options while maintaining fashion-forward sophistication, without having a dress made from scratch? Here are a few tips on how to find a range of customizable wedding dress options that fit your personality and budget, along with a few dress options from Beloved by Casablanca Bridal. Gather your squad, book an appointment at your local dress shop, and try on all the dresses. What better way to understand the silhouettes that look best on your figure than by gaining insight from those who know you best? Bring your bookmarked/flipped-through magazines and get your Pinterest board organized. Your Bridalista will look at them and talk to you so she can understand your aesthetic and expectations. Find a designer that offers customizable options that align with your aesthetic. Perhaps you found a silhouette that flatters your figure, but the design’s fabric and color doesn’t work with your skin type. Imagine being able to remove intricate details, color, and/or construction of a dress! You’d have your own personal design and brand when you walk down the aisle. Let’s be honest, you are able to cut a few corners or draw a line or two through a few names on your guest list to cut costs. The idea of limiting your wedding dress budget, however, is a hard NO. From the very beginning, keep your Bridalista engaged and aligned with your final cost. Doing so will ensure you’re both on the same page and will be able to make affordable custom decisions on your gown. A classic mermaid wedding dress that hugs the body under a looser scrolling lace with a plunging, strapless neckline sheathed by stretch illusion. This option can be styled for an indoor or outdoor wedding, thus creating versatile choices for the bride. Marina from Beloved by Casablanca was designed with your natural curves in mind. This dress will undoubtedly hug and stretch to complement your figure, with a fit and flare style providing a phenomenal fit. The delicate double spaghetti straps complement the V-neckline, and you can add even more personality with a jeweled belt. Isla is low cut, flattering, and youthful! The Isla is constructed from duchess satin, features youthful, convenient pockets, and has a delicate lace-up closure in the back. A beaded band wraps and accentuates the natural waist before flowing into an A-line shape. 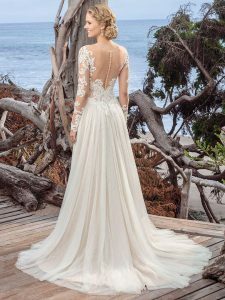 If you are looking for an elegant, yet spirited A-line wedding dress for your big day, this will not disappoint. If you have been looking for a romantic wedding dress with long sleeves and a soft high slit tulle skirt, then look no further! The Misty bride floats down the aisle, with a pop of skin occasionally peeking through the soft tulle in a flattering A-line figure. The bodice features an illusion bateau neckline and long sleeves covered in Chantilly lace. The beaded lace appliques craft a look that is simultaneously daring and delicate. If any of these styles look like the perfect wedding dress for you, come into Blue Bridal Boutique and meet with one of our Bridalistas. Schedule an appointment today!